Those who are registered Libertarian in Maryland vote at a lower rate than Republicans and Democrats, and in non-presidential elections, we vote at a rather abysmal 45% (42% in 2010, 47% in 2008). Given our commitment, we should be outperforming our opposition, but sadly, too many are swayed by the overwhelming odds or have simply given up. Let’s change these numbers in 2014 and make sure that we get the Libertarian base to vote. 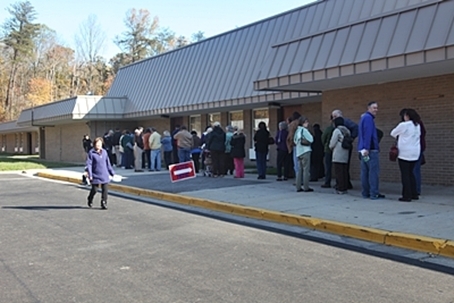 People who plan ahead where and when they will vote are more likely to actually vote. 10% of the people who tell pollsters they voted actually didn’t vote. If people are told that someone plans on distributing the list of people’s names who voted (or didn’t vote) to their neighbors after the election, people are more likely to vote. FACTOID ALERT: We at the Libertarian Party of Maryland would never do this, for obvious reasons. The decision not to vote is usually made on election day, not in advance, using an excuse (the weather, “too busy”, “not worth it”, the kids,etc.). People who know that their friends voted for a candidate are more likely to vote for that candidate. What do these facts mean? That people have an ambivalent attitude towards voting and libertarians more than most? Perhaps, but given that we keep getting the same results with Republicans and Democrats regardless of who wins, is it any wonder this is a consequence (though the more pernicious consequence is in the disastrous policies they enact). Yet for libertarians and those who prefer libertarian solutions (even if you like some, not all), the importance of voting is not yet who will win, but to send a clear and unambiguous message to the political establishment and media about your preferred policy choices. You won’t get that clear statement by voting for Republicans or Democrats. In addition, by voting Libertarian you support future efforts of the party here in Maryland, as it is critical that we reach at least 1% of the vote in the race for Governor, so that we retain ballot access for two more years. See this link for more details on the importance of the 2014 vote. As I noted in the beginning, if you are reading this, you are likely one of the committed, so what can you do? Reach out to your liberty loving friends from now until election day and make sure they are voting their preferences for liberty. If you know of anyone who might need a ride or other help getting to the polls, help them (or let us know and someone else can help). Post on social media that you have voted Libertarian. We have great candidates this year. Let’s support them and in the process, support our own political values. Author: Eric Blitz. This entry was posted in Opinion and tagged early voting, libertarian, Maryland.